Today, on 080808 an amazing figure 8 or , i.e. Infinity or the lazy eight as it's called, appeared below Milk Hill, Wiltshire. We have a message here friends ! Straight from a higher intelligence what we call "Aliens aboard their UFOs". It is telling us about who we really are and is pointing towards viewing the nature of reality with an open mind and realize, We are One ! We are Infinite ! These signs in the classical sense, leading to ascension which culminates on Dec 21st 2012 are shaking our belief systems about who we are and what is reality ? The process of revelation is slow as it takes time in a linear sense to empower a few billion clueless people in our present times. The date 8th of August, 2008 marks the opening of the crystalline gateway which streams in new radiant evolving light from a Solar Nebula somewhere not so far in the Galaxy. This energy affects our DNA and clears us of all the possible blockages of the 3 dimensional reality empowering us to tune into the crystalline gateway of the Christ consciousness. The Christ consciousness is to do with the Heart chakra or in simple words it's about love ! 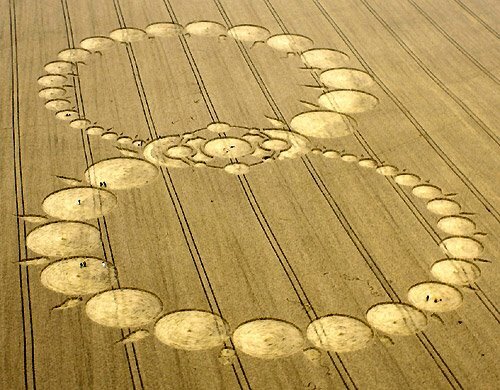 The crop circle formation 8 also symbolizes the lover's knot to all women who are into knitting, crocheting and craftwork. There are feathers on the inside of the upper circle and on the outside of the outer. Feathers stand for Truth. The second coming of Christ is opening of the Heart Chakra and to come to truly understand we are one and it's all connected ! The figure 8 also resembles the lover's knot known to most involved with knitting, crocheting & craftwork. The Feathers on the outside and the inside of the circles stand for truth. The increasing size indicates the importance of truth becoming stronger with time as we know it. ' Time To Awaken To Infinity ' Also, check out the "The Human Butterfly Crop Circle ~Netherlands" : The Biggest Crop Circle Ever ! Shine On ... "Crop Circle photos and reports courtesy The Crop Circle Connector (www.cropcircleconnector.com)"